For a recent family birthday, we chose to forgo the traditional birthday cake and do an Ice Cream Bar, instead. 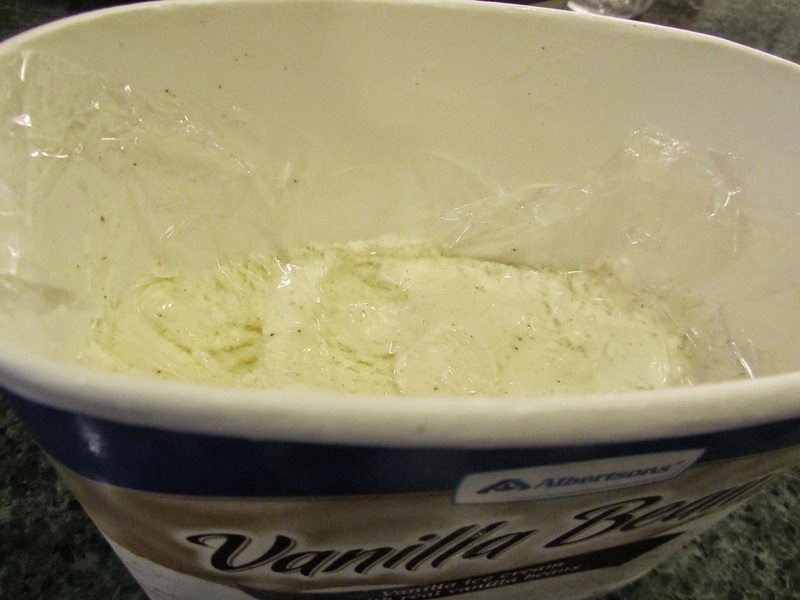 I had vanilla ice cream in the freezer, leftover from Easter (see tip below for keeping your ice cream from developing ice crystals after opening). So, that was the initiator of the Ice Cream Bar idea. I made caramel syrup and hot fudge sauce. I brought out the mint syrup and cherry preserves (both made last summer). I chopped some peanuts. And one daughter contributed some Oreo cookies that were given to her for her birthday (she could never in her life eat a whole package of Oreos by herself!). And that was the Ice Cream Bar. 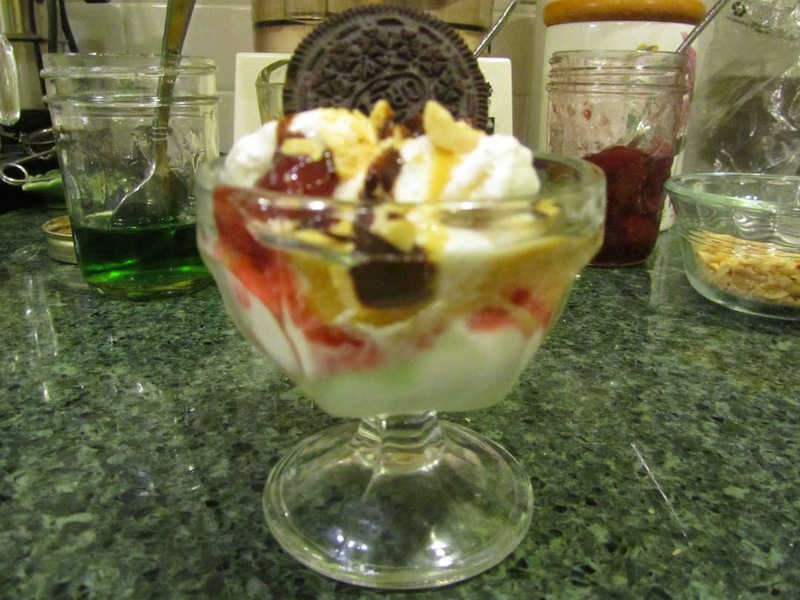 We all made our own sundaes, customizing to our individual preference. I think mine was more hot fudge than anything else! But I always find it interesting how each of us will customize our items so uniquely. *to keep your ice cream from developing ice crystals, after opening the carton -- place a sheet of plastic wrap directly on the ice cream, inside the container. Press out any air pockets under the wrap. Put the lid on, as usual. The ice cream will keep for many months without change to the surface texture or flavor. In my book, you can never go wrong with ice cream. Ice cream cakes are a favorite here. Ice cream cakes are delicious! All families are different. We tend to "save" ice cream for special occasions, so this was an opened container from Easter until this past week. And I think there are always treats to choose from in our home, so a package of Oreos can just linger for a while. I think you just made me crave ice cream! This sounds delicious and fun. Like Live & Learn, we've made ice cream cakes upon occasion--usually if we will be out of town and returning the day of the birthday celebration--I love that you can prepare ice cream cakes ahead of time and pull them out right at the moment needed. The mint syrup sounds delish. My son dislikes mint, so I don't get to eat it as often as I would like to. We tent-camp, so I'm having a hard time visualizing keeping the ice cream cake cold enough to be successful! It sounds like you had fun with it. The thing I love about ice cream "bars" is the opportunity to individualize your treat. Kids, especially, seem to love having the control over what they put on it. Yes, we've had a series of (very old and cheap and usually rebuilt by us) camping rigs, so we do have a freezer with us! The farthest one of our ice cream cakes has traveled before it was time to eat was 2000 miles. It took up a lot of our limited freezer space, but was definitely worth it! :) That one was dulce de leche ice cream on white cake with burnt sugar frosting. Heavenly! Your lucky son, that you came up with this great idea to make sure he always gets a nice cake. We have a lot of summer birthdays in our family, and since we grown-ups missed a lot of traditional birthday festivities because of that, we've worked harder to make sure that we plan well for the younger generation! I was shocked when I saw how expensive ice cream cake was! I'd never had one until I made the first one myself almost 20 years ago, They're very easy, though, and simple to serve, and refreshing; so we like them a lot. Besides saving a lot of money, though, no storebought cake will ever taste as good or be as right as a homemade one! Also, with something like this for a festive dessert, I'll usually pull out one or two of our "special" preserves/syrups. This time, it was the cherry preserves and mint syrup. And that makes it all the more "special". And you're right, it was very time-thrifty. If I baked a cake and frosted it, I probably would have spent about 2 hours of hands-on time. Where as with making the toppings, even with making caramel sauce and hot fudge topping from scratch, I believe I only spent about 45 minutes of hands-on time. Even us big "kids" loved being able to put as much topping on as we wanted!! LOL! Mine was way more hot fudge than ice cream. And everyone is free to add more toppings, as we eat down what we've already put on! That's just not an option when you go to an ice cream shop for sundaes. I love your idea to pre-make an ice cream cake and have it "holding" during a busy time. That's an idea I'll use in the future. Trail mix would have been good, too! Maybe some with M & Ms in it! OMG - Yum! You know - I've never had the problem of ice crystals forming on my ice cream, because once the carton has been opened, there's very little hope of it lasting more than a day or two! I am in awe of your self control! Not exactly self control. Just a way of rationing what we have, so the whole family can enjoy it another time (otherwise, one or two of us would polish it off, without the other family members getting a shot at more ice cream). Not an issue when your housemates are felines, and can't open the freezer door by themselves!